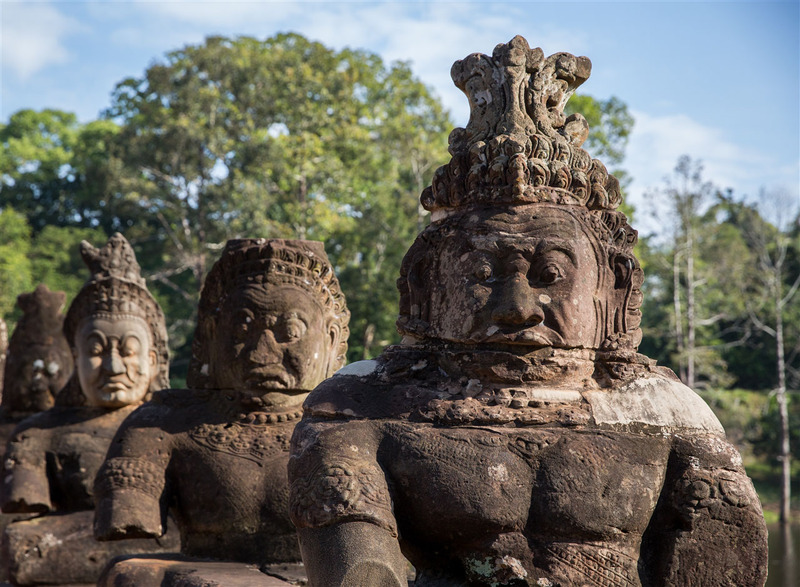 Angkor is both a confusing and complex site to describe. Scattered over four hundred square kilometers, with clusters of monuments set within their own unique context, sometimes by describing specific buildings you miss out on the peripheral that can hold an equal amount of interest. 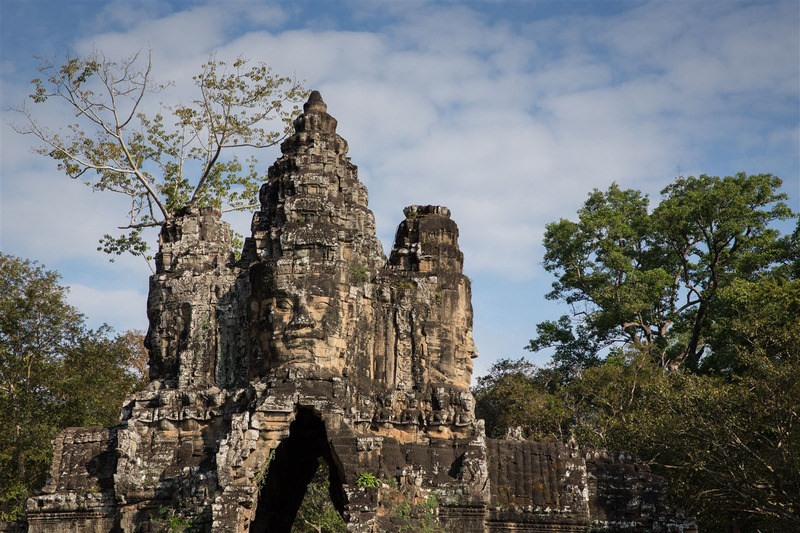 Angkor Thom is a good example. This was a city in it’s own right, covering an area of 3 square kilometers enclosed by a wide moat, an 8m high wall, and five impressive gates. 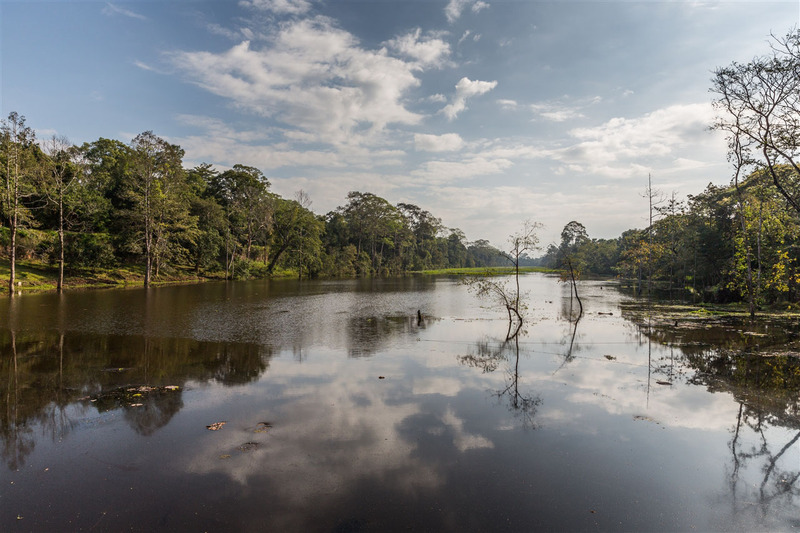 An 8m high wall, reinforced by a wide earth embankment, runs around the full perimeter of Angkor Thom’s moat. The wall has sanctuary towers at each corner and five entry gates. The gates are amazing structures in their own right, each featuring a tower topped by four huge faces of Bodhisatta Lokesvara. 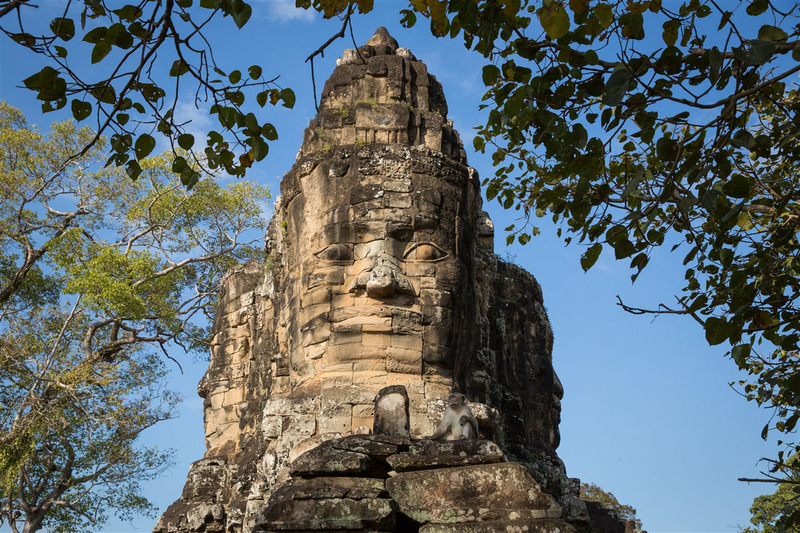 These are similar to the stone faces that can be seen at Bayon, but these gates are likely to be your first taste of what can be seen at that temple. Your approach to Angkor Thom is likely to be via the south gate, which means crossing the moat via a 300m long stone causeway. This causeway is hugely impressive, flanked by 54 almond-eyed gods on one side and 54 round-eyed demons on the other. Both the gods and the demons are holding a nine-headed naga (snake), which are said to protect the wealth of the city. Just east of Phimeanakas, the Terrace of Elephants is a wonderful bas-relief of almost life sized elephants stretching for nearly 300. 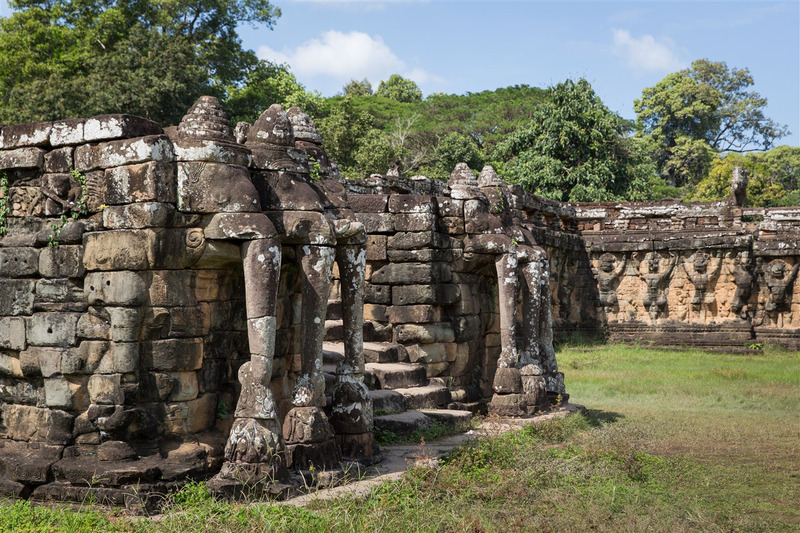 The platform above the terrace would have supported part of Jayavarman VII’s royal palace, now long gone. 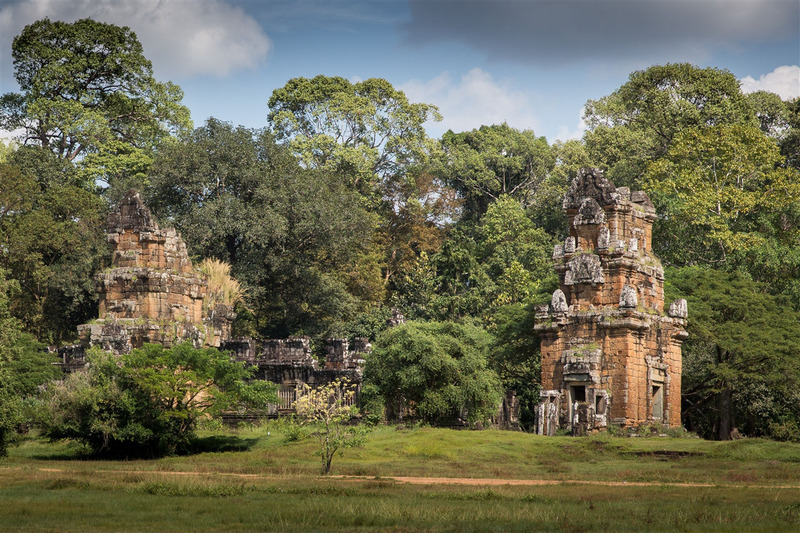 Seen off in the distance from the Terrace of Elephants, Prasat Suor Prat are twelve two-storey towers each with doors on two sides and windows on three. The current tower’s name in Khmer means “The towers of the tight-rope dancers”, a rather romantic name derived from local belief that they were used to support a high wire stretched between them for acrobatic purposes during royal festivals. This does not actually appear to be the case however. Zhou Daguan, a Chinese envoy that visited Angkor, describes in his records that the towers are used to settle disputes among Angkorian people.